This looks pretty much like the recipe I use only with boys in the house, mine is double. I’m a huge fan of buttermilk for baking (the real thing, the lemon/milk combo doesn’t taste the same to me) and like you, I must have a splash of vanilla in mine. Yum! I’ve never made a round pancake in my life. Do they really turn out that way anywhere but restaurants? 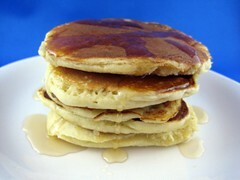 I always use Bisquick, and I’ve never tried a recipe to make them myself. You didn’t say if you liked them. Did you? @Liz @ A Nut in a Nutshell – They’re delicious! I can see how yours would be nice and fluffy. I’ll have to try them next time I’m making pancakes!